"Hands down, he’s the best speaker I've hired in many years -- and the best kept secret in the world of speaking." I love speaking! 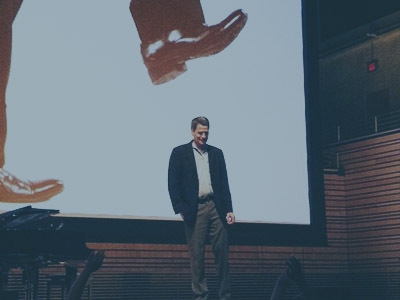 Each year, I present keynote talks at about 25 conferences, trade shows, and companies. I also conduct onstage interviews, moderate panels, and frequently serve as master of ceremonies for events. I’ve been the emcee for the Technical Emmy Awards every year since 2013. Maybe the word “talk” doesn’t quite describe it. I usually finish by sitting down at the piano and performing a couple of my tech-industry song parodies, like “Don’t Cry For Me, Cupertino” and “I Got an iPhone” (to the tune of “I Did It My Way”). Example: David's TED talk, "Simplicity Sells"
Here are some of the talks I've presented recently. I'm always happy to adapt them to suit the occasion. Click on a title to learn more about the talk. AI, blockchain, self-driving cars, wearable tech, Internet of Things, delivery drones, the quantified self, augmented reality, Alexa/Siri/Google Home: the tech of our world is changing faster and faster. But the fascinating part is the effect it’s having on the society and culture we once new. What will life be like when printed newspapers and printed books are niche relics? What are the ramifications of the massive services-for-privacy trade that young people, especially, seem willing to make? How can we trust the companies who harvest our data–and then, over and over, turn out to have betrayed our confidence? In this funny, fast-paced snapshot of the new world, New York Times columnist David Pogue will bring you up to date–and help you consider what we’ll gain, what we’ll lose, and what beliefs will shift into something we’ve never seen before. Ever since the self-driving beer truck completed its run across Colorado, it’s clear we don’t need people to drive our trucks. And what about Amazon’s entirely unmanned grocery stores, where facial recognition and other sensors know what you’ve pulled off the shelf and bill you automatically? There go America’s 8 million cashiers and retail workers. It’s time to start thinking about the post-robot, post-AI world. What will all of these displaced workers do, how will they get an income, and how will they find meaning? In this talk, I’ll explore where we are on the road to automated employees, prepare audiences practically and emotionally for that very near future, assess just how good or bad the situation will be, and evaluate some of the solutions. In the beginning, there was bitcoin: The entirely digital currency that eliminated financial middlemen like credit-card companies and governments. Then came that e realization: The real breakthrough was not bitcoin itself, but the distributed, immutable digital “ledger” that it relied on. When every participant in a transaction has his or her own ledger, errors, fraud, and inefficiency can result. But if all parties rely on the same record of transactions, there’s only one version of the truth. That’s blockchain. What we have to gain: Security, trust, transaction speed, lower costs. True believers say that there’s not an industry on earth that won’t benefit from blockchain technology. But is blockchain as secure as it’s hyped to be? Should we trust something that’s so complex, very few truly understand it? And what about the staggering environmental cost of the computing power that makes it go? Tech columnist David Pogue, called “one of the world’s best explainers” by Wired cofounder Kevin Kelly, takes you through the rich, thrumming promise—and peril—of the blockchain future. This year, 70 million people will buy small, wearable trackers that monitor activity, sleep, diet, sleep, heart rate, blood pressure, blood oxygen, glucose level, sunlight exposure, posture, skin temperature, and more. This new era of apps and devices is turning amateurs into self-testing, self-diagnosing medical hobbyists. The “quantified self” movement benefits consumers, sometimes infuriates doctors, and delights medical researchers, who can now harness these terabytes of 24-hour medical data to conduct medical studies with jaw-dropping speed and scope. Can patients be trusted to use these devices properly? Will they be tempted to skip out on proper medical care? Will they challenge their doctor’s advice? And what about privacy? 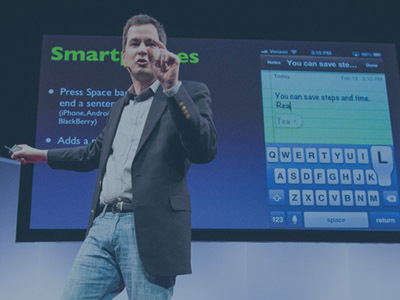 In this intriguing, entertaining presentation, tech columnist David Pogue explores these questions, provides some answers—and demonstrates some of these new gadgets and apps, so you’ll know what you’re up against. Modern technology has transformed every corner of our lives: business, relationships, learning. But we’ve immersed ourselves in digital tools—the tablets, touchscreen phones, ubiquitous Internet—without much concern for the potential dangers. It’s no secret that our children are dying on the highways as they text while driving. But what about cellphone radiation causing brain cancer? What about the obesity epidemic? What about studies that show how the multiple-gadget multitasking habits of college kids are causing permanent changes in their brains? And how much does it matter that our data is being harvested and manipulated at unprecedented rates? 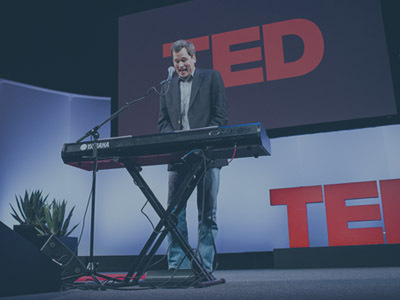 Nobody stands in such a sweet spot of science and technology as David Pogue, columnist for the New York Times and tech correspondent for “CBS Sunday Morning.” In this fascinating, surprisingly entertaining talk, he’ll bring you the very latest scientific research on these techno-dangers. He’ll tell you what’s genuinely worth worrying about, and why there’s also cause for hope. David is a non-stop show with laughs, music (he writes and performs) and common sense advice. He wowed the crowd! For information on fees and availability, please fill out the form to contact my agent, Jan Tavitian at American Program Bureau. She keeps my master calendar, she knows the ropes, and she’s great to deal with.